There are many reasons why the civilised traveller should visit the quietly elegant city of Piacenza, 45 miles south of Milan. Here are two of the best: Botticelli’s remarkable painting of Our Lady, the Infant Jesus and St John (which hangs in the Palazzo Farnese), and the astonishing and delightful trompe l’oeil interior of the Church of San Sisto. Both these are within a few steps of the Grand Hotel Rome. But then, everything you will want to see in Piacenza is within a few steps of the Grand Hotel Rome, for it could not have a better location. Just around the corner from the piazza Cavalli, this austere modern building was built in 1958 to the designs of architect Vico Magistretti. But if outwardly it appeals to the modernist, its interior will warm the heart of the most fervent traditionalist. 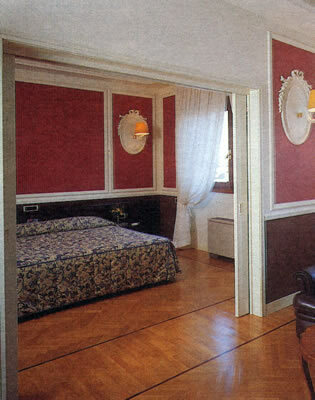 Its 72 rooms and 4 suites are old-fashioned (in the best sense), comfortable and thoroughly welcoming, and provided me with the ideal base from which to sally forth into the city of palaces. 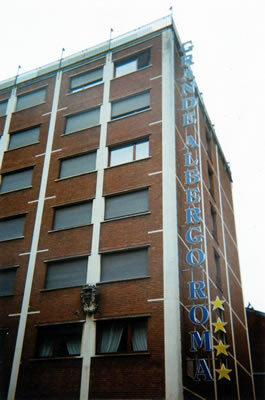 The hotel’s atmosphere derives much from the fact that it is family-owned and family-run. 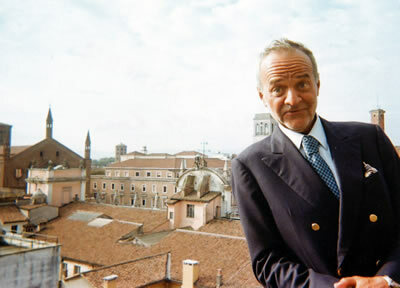 I have included a picture of the General Manager, Piero Prati, because he is very much in evidence, ensuring that all is well. And it was certainly well up on the fifth floor, where I was billeted in the Rossini Suite (350€ a night, bed and breakfast for two). I found this well-planned accommodation just what I wanted. Its colours of red, brown and beige were restful, its lighting (from table lamps and wall lights) was well judged and its space was generous. A walk-in wardrobe off the entrance hall had plenty of hanging for my suits, as well as a private safe. The sitting room had a decent Persian carpet, two leather armchairs and a writing desk. Through sliding doors was the bedroom, with more Persian rugs. The two spaces shared a lovely parquet floor. In the bathroom were white tiles, beige marble, one wash basin and a tub of good size with a shower over and a jacuzzi facility. Seeking some good music for my afternoon doze, I found on the television Swiss Classical Radio, a most civilized station to which I listened throughout my stay. 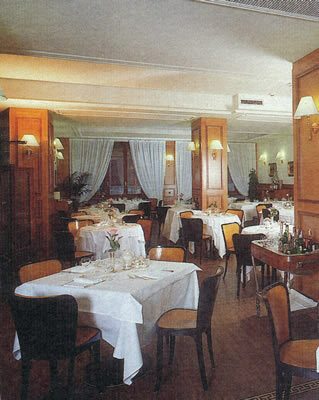 More music was to be heard in the hotel dining room, the Ristorante Piccola Roma, on the ground floor. Regular readers will know that I am not a fan of canned music in restaurants, but here it was big band ‘swing’ and set at a modest level, so I was content. The chamber is a handsome one – one might suppose that it dated from 1898, rather than 1958 – with dark, masculine colours and cream napery. It also boasts a feature new to me – graffiti on the walls, written by famous visitors. These included the thoughts of Signor Silvio Berlusconi. Sadly, I was not asked to contribute my own bons mots. Chef Carlo Rocca sends from his kitchen dishes which are honest, straightforward and enjoyable. I rather fell in love with his gnioccho, warm local bread which had a ravishing aroma which took me straight back to the freshly cooked doughnuts I used to devour at the seaside as a little boy. Indeed, I had to stop myself from eating too much of this treat – dipped, of course, in the extra virgin olive oil poured out by the waiter – for I was in danger of ruining my appetite for the dinner proper. 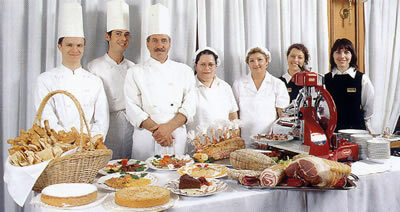 From my dishes, I would commend to you the good Culatello ham, the nettle savarin with Taleggio cheese fondue, the excellent pasta – both in the form of tortelli with cottage cheese and chard and as anolini with meat (in broth) – the New Zealand lamb with mint sauce and the Argentinian beef. This last was sirloin, full of favour and sliced – served with excellent roast potatoes. The wine list is short and Italian. In price its 45 offerings run from 14€ for a local white to 140€ for a Barolo. Sassicaia and Ornellaia are both 130€ and Tignanello is 75€, although vintages are not given. The local red is fizzy (frizzante), and actually goes quite well with the food. I tried the Gutturnio Baraccone and the Gutturnio La Pernice (both at 15€). Breakfast should not be missed, because the Breakfast Room on the 7th floor has both a terrace (on which I sat) and a charming view over the rooftops to the piazza Cavalli and to the façade of the Church of San Francesco. From the buffet I took each morning dishes of fresh fruit salad, plates of cheese and ham, helpings of bacon and scrambled eggs and (tell it not to the doctors)… doughnuts. (I really did begin to think I was in my second childhood.) These were washed down with cups of coffee poured from silver pots. I enjoyed these breakfasts. And I enjoyed my visit to Piacenza. 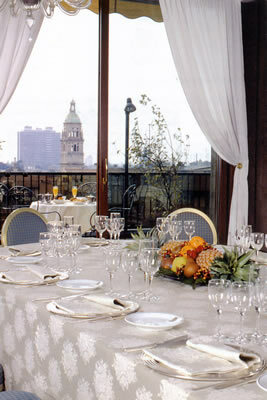 I would be happy to return – both to the city and to its best hotel, the Grand Hotel Rome. Via Cittadella 14, 29100 Piacenza, Italy.